Built on recommendation and 30 years experience, we provide a full professional service from free planning and design through to complete bathroom installation operating throughout Stockton on Tees and the surrounding areas. We pride ourselves on offering a high standard of workmanship, attention to detail and total customer satisfaction. We see the job through from beginning to end, often exceeding expectation. Many of our customers come to us through recommendation or previous customers returning to us a second time for more work, so if you need a bathroom fitter in Stockton on Tees why not contact the team at Clarkson Plumbing today? Are you experiencing central heating system problems? Perhaps a burst pipe is turning your property into a rather large puddle. In either scenario, you’ll be needing to enlist the services of a reliable Stockton-on-Tees gas engineer. It’s important to be careful about who you hire for the job, as not all gas engineers are equal – some will provide a quick fix solution or perhaps no solution at all. Make sure to speak to Nick Newbould Plumbing and Heating Ltd to hire a highly experienced, time served Stockton-on-Tees gas engineer. As a local and independent Darlington gas engineer, we recognise the importance of providing an honest and reputable service that represents real value for money. Growing our business progressively from strength to strength, we acquire nearly all our work through repeat custom and positive recommendations. For more information or to arrange a free quote for any plumbing or heating related project in Darlington, you can learn more about us and our services or please contact Silverdale Gas today. CK Plumbing and Heating takes care of your plumbing and heating with just one call. Does your central heating have trouble keeping the house warm? Need help designing the bathroom suite you always wanted? Then we are the team to call! Established in 2000 as local plumbing and heating engineers, we are now proud to be one of Teesside’s leading utility contractors offering support for homes throughout the region. We are proud members of Check-a-Trade and Checked and Vetted. We are also fully insured! A M Gas & Heating Services is a local, family-owned company that puts our customers’ needs first. We are the new kind of plumbers and gas engineers in Hartlepool, with the communication and professional skills to match our Master Plumbing expertise. 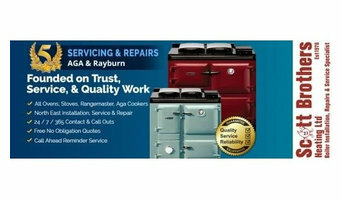 At A M Gas & Heating Services we pride ourselves on our professional approach. We will always go “the extra mile”, ensuring our service exceeds your expectations, with swift response times to your queries – and leaving your building just as tidy as we find it! Our team of gas safe registered gas engineers in Hartlepool offer the full range of residential and commercial plumbing and heating services throughout Hartlepool. Whether you need a leaking tap fixed in your kitchen, or a new central heating system installed- or anything in between – A M Gas & Heating Services plumbers are on hand to help, 24 hours a day. 7 days a week. Local to the Durham area, all of our plumbing & heating engineers are gas safe registered and can service, maintain or replace your boiler, help unblock your drains and fit your bespoke bathrooms. Call now for your FREE no obligation estimate. Drain Devil are proud to be the leading drain cleaning company in Redcar, providing local drainage services to both commercial and domestic customers. If you live in North Yorkshire, make us your preferred choice for all drainage and plumbing services. Furthermore, our professional team will provide you with all these services at a reasonable price as well as exceptional customer care which will surpass your expectations. Plumbers in Yarm, North Yorkshire can do more than just fit sinks and fix toilets; for any water or gas fixture there’s a plumbing company that can repair, install or even design it for your home. In the kitchen, you’ll need local plumbers to hook up your sink, dishwasher and washing machine to the main water supply and the drainage pipes, and they may be able to help with waste disposal units, gas hobs and plumbed-in fridges that dispense ice and water. In the bathroom you should hire Yarm, North Yorkshire plumbers to install your main bathroom fixtures – showers, baths, sinks, toilets and bidets. Plumbing companies and heating engineers can also install towel radiators, shower body jets, bath spas and possibly underfloor heating. Plumbing doesn’t have to stick to the kitchen and bathroom, either. Plumbers can install water taps outside for hoses and sprinkler systems, or you may want outdoor water features, such as a fountain, pond, pool, hot tub or shower; all of which you can talk to Yarm, North Yorkshire local plumbers or plumbing companies about. You may find that you need a plumber to work with a tiler, kitchen designer or architect so that your whole redesign can come together seamlessly. Here are some related professionals and vendors to complement the work of plumbers: Main Contractors, Septic Tanks & Sewage Systems, Kitchen & Bathroom Designers, Kitchen & Bathroom Fitters. Find local plumbers on Houzz. Narrow your search in the Professionals section of the website to Yarm, North Yorkshire plumbers and plumbing companies. You may also look through photos of Yarm, North Yorkshire projects to find a plumber who has worked on a project similar to yours.